This paper describes the connection between stop spacing and person-weighted accessibility for a transit route. Population distribution is assumed to be uniform along the line, but at each station, demand drops with distance from the station. 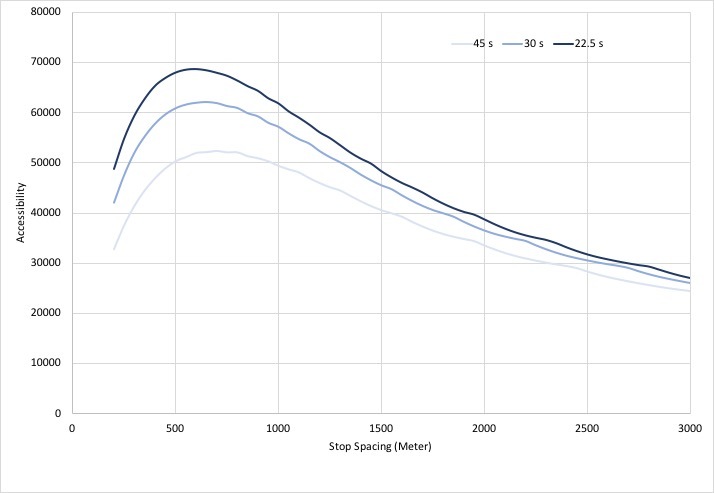 The study reveals that neither short nor excessive stop spacings are efficient in providing accessibility. For the configuration of each transit route, an optimum stop spacing exists that maximizes accessibility. Parameters including transit vehicle acceleration, deceleration, top speed, dwell time, and pedestrian walking speed affect level of accessibility achiev- able, and differ in their effect on accessibility results. The findings provide an anchor of reference both for the planning of future transit systems, and for transit operators to make operational changes to system design parameters that improve accessibility in a cost-effective manner. The study technically justifies the “rule of thumb” in setting different stop spacings for metro, streetcars, and other different transit services. Different types of transit vary in their ability to provide accessibility, slower moving streetcar (tram) type urban rails are inherently disadvantaged in that respect. Thus the type of transit service to be built should be of particular concern, if the transit is to effectively serve its intended population.